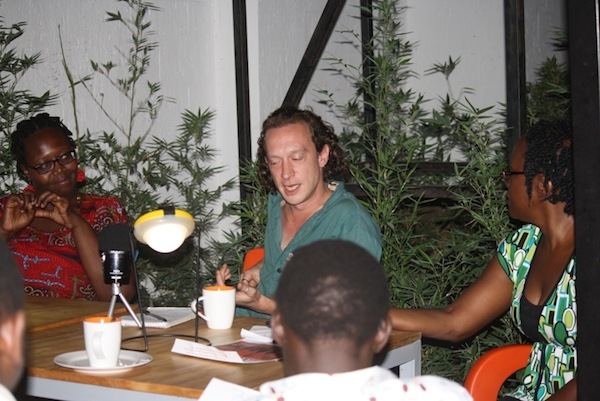 Censorship was the subject of the eighth edition of the Wazo Talking Arts series. As always the Wazo talk proved to be an invigorating session with a passionate and engaged audience as well as panellists. The panellists were: Angella Emurwon (playwright and theatre director) and David Cecil (film lecturer and owner of Tilapia Arts Centre). There were supposed to be four panellists, but the other two Abbey Mukiibi and John Ssegawa (co-directors of the play State of the Nation) were unable to attend. The discussion at times therefore became (perhaps unhelpfully) focused around the controversial play The River and the Mountain (written by Beau Hopkins, directed by Angella Emurwon and produced by David Cecil). The discussion was moderated by Ms. Doreen Baingana (chairperson of Femrite and one of the founders of Wazo). 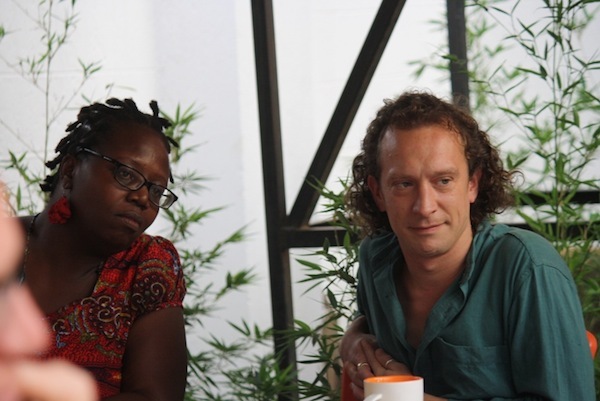 Angella Emurwon and David Cecil at WAZO Talking Arts, Kampala Feb 5 2013. Ms. Baingana started the evening’s session on the premise that art is censored in Uganda, as reflected by the events that transpired when the Media Council of Uganda banned the play The River and the Mountain and the subsequent arrest of David Cecil for four days (he was later released without charge) and eventual deportation in February 2013. Ultimately, this latter question became the central theme of the discussion. This prompted questions of what artists at the talk meant when they spoke of “censorship of the arts”. To ask the question of whether art is indeed censored in Uganda, we have to address what we mean by censorship of the arts. There were competing ideas and understanding about and of the issue of censorship. And perhaps the discussion would have benefited from an initial examination of what we meant by censorship. The Merriam Webster online dictionary defines censorship as: [The] act of changing or suppressing speech or writing that is considered subversive of the common good. As the discussion developed so did the broadening of the definition of censorship. There were several variations of definitions of censorship, as it relates to the arts in Uganda and the discussion then centred on these other forms of censorship. Namely, state censorship, structural economic/cultural censorship and self-censorship. When the artist, Daudi Karungi, asked the question of whether the arts are really censored in Uganda, he was likely referring to state censorship. There is of course state censorship in Uganda, governments in all societies practice some form of censorship. It is the degrees and justifications that vary, and those relate directly to the extent to which the principles of democracy and the laws of the constitution are upheld in a given state. In Uganda, the emphasis on state or state-sanctioned censorship has appeared to do with suppressing views that contradict or criticise the government’s position and practices. The second dominant form of censorship in the last few years has to do with the issue of homosexuality. The government seems worryingly far less concerned with issues like the pornographic content in some national newspapers. The two plays that were banned in 2012, not coincidentally, raised issues that provoked the government’s primary concerns: opposition politics and homosexuality. The government’s position when it banned these two plays was ostensibly to protect the peace and the moral beliefs of the country respectively. 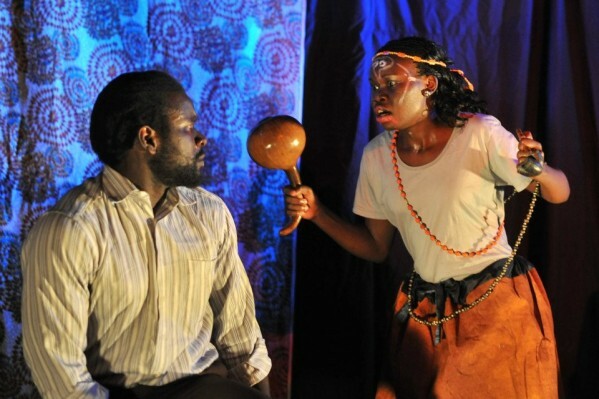 The River and the Mountain, performed at Tliapia Culture centre, Kampala, August 2012. Karungi’s question of whether state censorship of the arts exists, related to another issue he and other artists at The Wazo talks raised, which is that the government pays little attention to the arts. Both plays actually ran for some time uncontested by the Media Council of Uganda. State of the Nation ran for a few weeks while The River and The Mountain ran for a shorter period before both were banned. The delay in censoring the plays is to be expected. Governments with little resources tend to censor after the fact, waiting to see who raises their head above the proverbial parapet and whether the public is drawn to the artists’ message. The government’s seeming ignorance of the arts (until provoked) suggests two things. Firstly, that the arts in Uganda are not producing anything qualitatively worthy of notice. And secondly, that if they are producing anything of quality and worthy of notice, there is no significant penetration into the public consciousness for the government to worry about the subject matter of the art being produced. Hence, the perception by the artists gathered at the 8th edition of the WAZO talks that there is no overt state censorship of the arts in Uganda. If artists in Uganda are not challenging the status quo, not provoking debate and discussion in the public arena, not attracting the state’s attention (both positively and negatively), is this a problem for the development of Ugandan arts? The answer here I think is, yes, it is a problem. Not all art is going to be provocative, nor should it be, but some of the art created in a society must provoke the imagination, the senses and even our consciousness; and there should be art that makes us ask questions of ourselves and of the world we inhabit. The State of the Nation and The River and the Mountain may have been provocative, but did they raise debate around the subjects they covered, did they ask questions of us, and did we respond as a society? So much of the discussion became about the banning and not enough was an exploration of what the plays were really about. Indeed, Ms. Emurwon said that one of her main frustrations was that so many people who criticized the play had not even watched it, including some of the censors. If Ugandan writers, painters, sculptors, dancers are not disturbing the peace, or at least to the degree one might expect—and that of course is debatable—then what is stopping them? This brings us to the other forms of censorship discussed at Wazo, namely structural (as distinct from state) censorship and self-censorship. All artists face the structural censorship of economics (funding) and culture (the prevailing societal beliefs and norms). But the Wazo talks addressed a very particular kind of structural economic/cultural censorship, which is perpetuated by the western NGO funding system. Mr. Cecil argued that western NGOs are responsible for a kind of economic/structural censorship in theatre, where the plays produced follow an NGO-influenced agenda. The argument here is that NGOs are insisting that particular stories be told in order for artists to secure funding thus limiting, or at least inhibiting, the artists’ imagination. Artists begin to focus on ideas that will garner them donor money and get them on the festival circuit rather than work that drives their souls and intellect. I have raised a similar point regarding the films being made in Uganda; although I did not see it as censorship, rather an attempt by NGOs to direct the agenda of discussions in developing societies in service to their own economic (funding) and national interests, and local artists falling in line to collect the money and executing those interests on behalf of western NGOs. But is this censorship? And if it is a structural form of censorship is it economic or cultural? Perhaps it is, in a sense, censorship, and it is in this instance both economic and cultural. And it can be more nuanced and complicated than it first appears. People often follow the money, that is straightforward enough. But economic censorship affects what is written (NGOs influencing the stories being made) as much as what is not written. 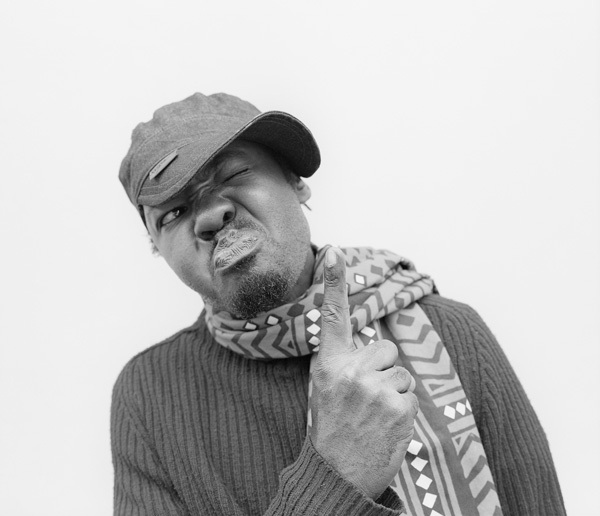 There is a certain irony in Cecil’s assertion that NGOs censor the arts in Uganda by insisting on their own agenda, because some of the objection exhibited at Wazo to the play he produced was that there was suspicion that it had been funded by what someone referred to as the “pink dollar” (a reference to a liberal gay lobby). The fact that the play was written by an Englishman, and produced by an Englishman seemed to bear out the resentment and suspicion by some, even in the art world, that there is an insistence by western entities to direct the national agenda of developing countries by funding particular arts projects which may go against the dominant beliefs and culture of the local population. In a sense, Mr. Cecil and some of those who objected to the play were making the same point but from different perspectives. 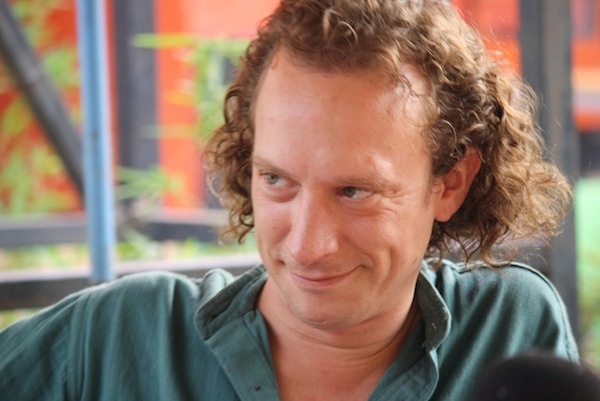 David Cecil at WAZO Talking Arts, Kampala Feb 5 2013. Was it right to censor the play? This issue of structural economic/cultural “censorship” (influence) in this regard raised a lot contention, and the focus of the discussion then centred around whether the government of Uganda had been right in banning the play The River and the Mountain, because it was believed to be promoting ideas and practices that went against Ugandan culture. Quite a few people asserted that perhaps the government was right to have censored the play, because developed nations (via donor/NGO funding) were introducing ‘ideas’ that were ‘foreign’ to our culture and funding them. In a sense the perception was that it was not Ugandans “disturbing the peace” but rather Western developed nations. And this dynamic raised the perennial concerns, among the artists at Wazo, of neo-colonialism even within the arts in developing nations. I believe that each artist has the agency to look for ways to make the kind of film/play or art he/she wants to make, which sometimes means to choose not to follow the ‘easy’ money. Mr. Cecil’s case against what we have determined as “economic/cultural NGO censorship” seems to suggest that the artists have little choice in the matter since the sources of funding are very few and there is almost no government funding for the arts in Uganda. The other side of the coin here is that an artist is also entitled to determine whose money they want to take and what social, cultural, political and/or personal story they want to pursue in their art. Funding from the government would clearly also have its own inherent restrictions on the artists freedom to express his/her ideas, particularly so, in a socially conservative nation like Uganda. State censorship exists, structural economic and cultural censorship, as we have defined them, exist, but at the Wazo talks there seemed to be a consensus that perhaps the most insidious form of censorship is self-censorship. In the course of the discussion the greatest censorship threat was determined not as external, but rather internal. 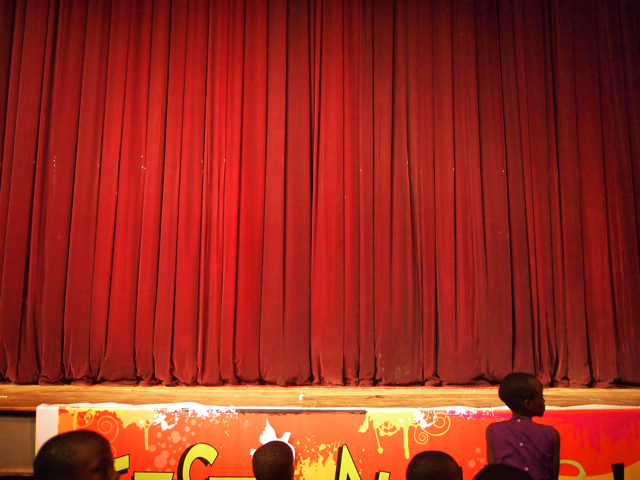 The curtain at the National Theatre, 2012. Not many at the talk could answer Xenson’s question of whether the police had come knocking at our doors in relation to their artistic expression, in the affirmative. Are Ugandan artists shying away from the big questions because they are afraid? Ugandan visual artist Xenson. Photo by Stuart Williams for KLA ART 012. Many people made the case that even the perception of state censorship is sometimes actually self-censorship. What exists in Uganda seems to be a fear of censorship by the state and conservative societal norms that prompt artists into pre-emptively censoring themselves. The case could be made that self-censorship is probably a greater threat to the arts in Uganda than state/interest group driven censorship. Someone at the Wazo talks suggested that perhaps artists should have a special place in Uganda to say what they want; but there is no special protection of an artist’s right to free speech in other societies. The right to free speech/expression where it exits is for all citizens; and the effort to enjoy, enforce and preserve that right cannot be reserved for certain groups. Artists have to fight for their right to say their piece; and of course this fight is more challenging and at times even dangerous in developing and not fully democratic states. Angella Emurwon closed the talks with the assertion that the best counter to censorship is for artists to have the courage to tell the truth and for artists to become honest critics of their work and that of their peers. The impetus is on the arts community in Uganda to get Ugandans thinking about the arts as an important and vital space in which to articulate and delineate their various complex experiences as human beings. 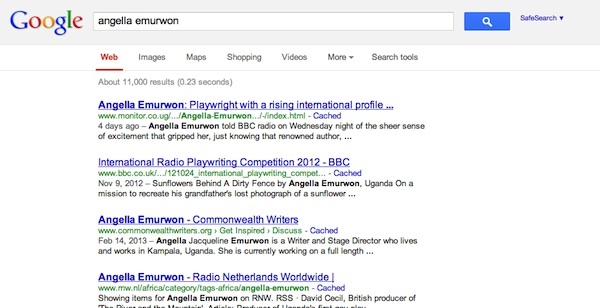 Startjournal googled ‘Angella Emurwon’ from a Ugandan-based computer, February 26 2013. Safe Search Filter is switched ON. 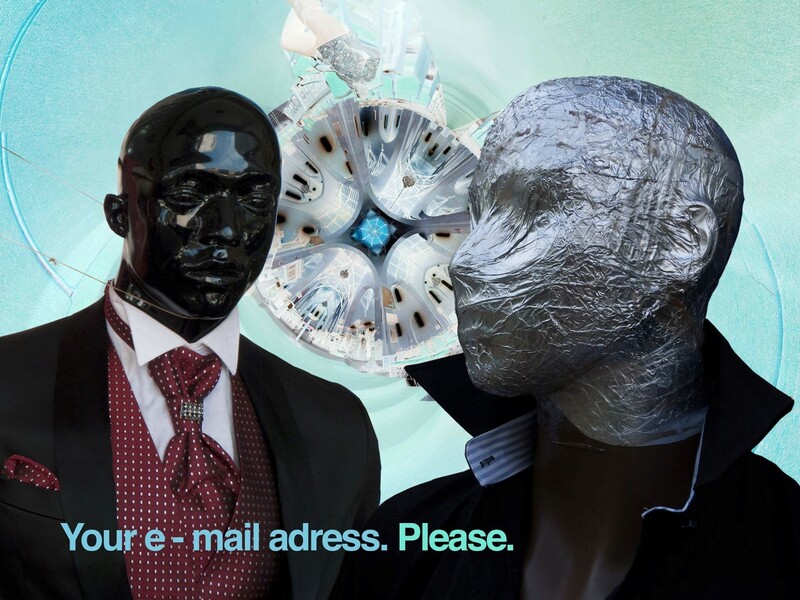 Startjournal googled ‘Angella Emurwon’ from a Ugandan-based computer, February 26 2013. Safe Search Filter is switched OFF. Artists need to engage with their audiences and become honest arbiters and stewards of the arts within the public sphere. This is one of the best ways in which artists can protect their freedom of expression and preserve their personhood in a space that is still very much contested and still arguably in its inception stage. One need not agree with Baldwin, but there is one implicit truth in his words, which is that all the great work done in the world, however big or small, requires courage, and the same applies to art. The best antidote to censorship is courage. As the eighth edition of the Wazo Talking Arts proved, while the expectation is of artists to be at the forefront of debate and to challenge the status quo, artists are also a product of their culture, religion, and politics; their work cannot be separated from their experience. In other words artists are human beings, artists can be frightened, and artists can be ideologically conservative or liberal. If there is one attribute that artists need to create meaningful, challenging, even great work in the face of possible censorship, then that attribute is courage. Art that challenges, is art that discomfits the intellect and the emotions, it moves you from complacency; as James Baldwin said, “[it] disturbs the peace”. Before they can disturb the “society’s illusion of safety”, they have to disturb their own. Thanks for an interesting summary, Farida. It was a great shame indeed that Segawa and Abbi were unable to represent their experience with State of the Nation. This would have helped to divert the conversation away from issues of cultural imperialism, which were misleading. I must affirm a key point here: The River and the Mountain was a piece of entertainment, first and foremost. It was also not ‘foreign’ at all, but the original idea came from a group of Ugandan actors/actresses. It was co-written, not written alone, by a British writer. It was co-produced by me and Angella Emurwon, a Ugandan. The funding was not from an NGO but came from the proceeds of a local busines, owned by a Ugandan (Tilapia, Bunga), and from a crowd-sourcing website called wefund.com (where donations are gathered from people interested in funding the arts, not for political purposes). All the cast were Ugandan, with one exception. 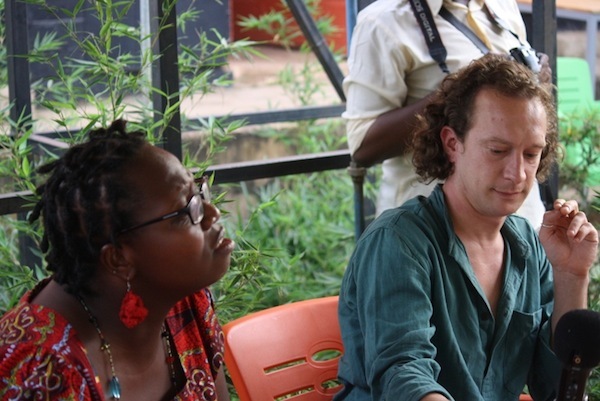 The story was conceived, written, and performed in Uganda, with a Ugandan director. It was, therefore, Ugandan, not a foreign import. The talk of ‘pink dollars’ at Wazo came from one individual who had not seen the play nor knew anything about the production. Its mention at Wazo was therefore an irrelevant distraction. Now I have been abruptly and indefinitely silenced, since I was incarcerated, without charge, the day after the Wazo meeting and deported a week later with no given reason, nor trial, nor chance to appeal. So much for the constitutional right to freedom of expression in Uganda. am glad i was able to attend WAZO(my first time), and still has the chance to read through what happened during the Talk. Thanx Start Journal. David, thank you for the clarifications regarding the play and its production. When I referred to NGOs’ funding of the arts in Uganda I was using the acronym in the generic sense to refer to aid/funding/support from developed nations to developing nations. I perhaps should have stated that more clearly. As far as the distinction between “art” on the one hand and “entertainment” on the other and the justifications that may follow from that distinction, as you well know, that is a debate of its own. Hopefully, the organizers of Wazo will consider it for a future discussion topic. Regarding my reference to the “pink dollar” remark made by someone at the talk, I included that remark and some of the issues that arose around it because the suspicions expressed at Wazo are pervasive in Ugandan society. One individual may have made the remark (supported by one or two others) but there is nothing unique or singular about that viewpoint. Many others share that perspective, and I therefore felt it important to include the remark in my article on the evening’s discussion. Thank you for highlighting the issue of “social censorship”. There is so much more to say on the Wazo discussion on “censorship of the arts” but only a finite amount of space, here, to say it. I am simply thankful that Wazo and Start afford us spaces to engage with the arts in a thoughtful and collaborative manner. Thank you again for the clarifications and your comments. Thank you Farida for this great article although I thought that both plays were only banned from showing at the National theatre…I could be wrong.